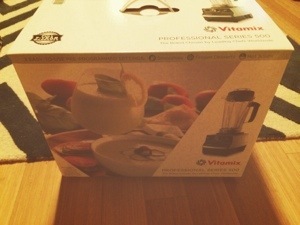 I got my new toy yesterday: my Vitamix finally arrived!!! So of course first thing this morning I took it for a test drive with my morning smoothie. I loved the creamy texture it provided to my smoothie, and how easy and powerful it is. 1) Put ingredients into a blender and blend! I got a new high power blender recently (a b’day present 7 months late, it happens). and doesn’t it rock! OMG I love it, making home made mayo is so much easier now. Haven’t tired a smoothie yet, but I do plan on making my own almond milk. We’d love to get one of those! I’d definitely be making many a smoothie. yumm that smoothie sounds really good! 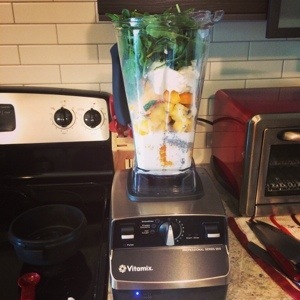 I am totally jealous of your Vitamix, one day maybe I will buy one !